Although Carolina’s Cam Newton is 6-6 and 260 pounds and Seattle’s Russell Wilson is 5-11, 203, it’s remarkable how similar are their respective achievements. The 15-1 Carolina Panthers, the NFC’s No. 1 seed, have been made a 2½-point pick over the sixth-seeded Seahawks (11-6) Sunday in their divisional playoff game in Charlotte. The Panthers received the nod largely on the basis of overall superior record, home-field advantage (8-0) and likely MVP Cam Newton, who had a 104.5 passer rating this season at Bank of America Stadium. The Panthers enter with the NFL’s No. 1 scoring offense (31.2 points per game), the Seahawks with the league’s No. 1 scoring defense (17.3). It’s not often No. 1 meets No. 1 in the postseason. Since the NFL adopted its current playoff format in 1990, there have been five such pairings from the divisional round through the Super Bowl. No side of the ball has dominated, the No. 1 offense winning twice, the No. 1 defense three times. The No. 1 offense defeated the No. 1 defense in 1993 (San Francisco 44-3 over the New York Giants, divisional round) and 1997 (Denver 14-10 over Kansas City, also divisional round). The No. 1 defense prevailed in 1990 (Giants 20-19 over Buffalo, Super Bowl XXV), 2013 (Seattle 43-8 over Denver, Super Bowl), and 2014 (Seahawks 28-22 in OT over Green Bay, NFC Championship). Sunday’s outcome is sure to be dictated by which quarterback, Newton or Russell Wilson, best handles himself. Wilson threw 34 touchdown passes this season with only eight interceptions, but Carolina led the NFL in turnover margin. Newton threw 35 TDs, but is 1-3 with a meager 54.5 completion percentage and 69.0 passer rating in four games against the Seahawks. Both are coming off the best seven-game stretches of their respective careers. Newton threw 20 TD passes, one interception and posted four passer ratings above 115.0. He also had three, five-TD games. Wilson threw 24 TDs with one pick and produced six ratings above 120. He had two five-TD games. Although Newton is 6-foot-6 and 260 pounds vs. Wilson’s 5-11 and 203, it’s astonishing how similar their results have been since they entered the league, Newton as the first overall pick in 2011 out of Auburn, Wilson as the 75th player selected (third round) in 2012 out of Wisconsin/North Carolina State. Both have been voted to two Pro Bowls. Newton has 117 TD passes in his first five years, Wilson 106 in his first four. 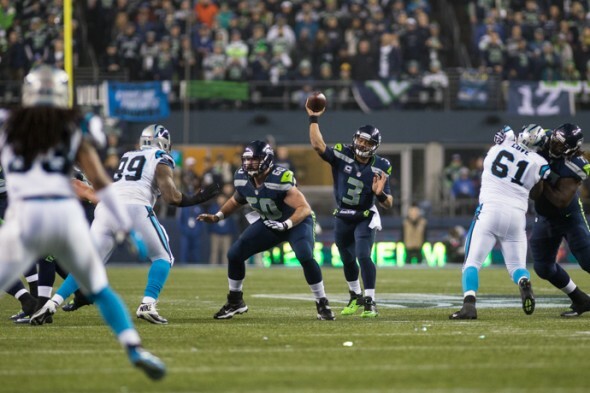 Wilson is the more efficient passer with a 101.8 career rating to Newton’s 88.2. Newton has rushed for 43 TDs (NFL record) to Wilson’s 12, but Wilson’s ability to create havoc and extend plays with his legs is unmatched even by Newton. Wilson has more playoff history to overcome than Newton. Six teams before this year’s Panthers finished 15-1, but only one lost in the divisional round on its home field, the Green Bay Packers dropping a 37-20 decision to the New York Giants at Lambeau Field Jan. 15, 2012. Great comparison Steve, thanks! It’s amazing to see these two rewrite the record books. While these two QBs are shoulder to shoulder in accomplishments, these two teams playing in Charlotte are also shoulder to shoulder. I don’t ever recall a blowout, and I believe it’s always been close between us, and usually low scoring with the final results being the difference of a field goal. To me, the Panthers have kind of become honorary members of the NFC West, as they stand toe to toe with us as our division rivals always do. Love the competition, but more the way that Russell and the rest of the team find ways to up their performances and win! Last game in Seattle was an aberration; simply put, our team was broken, yet the game was still fairly close. Not so now. I’m looking forward to “humble” Russell outshining “show-off” Cam as the Seahawks once again put the Panthers in their place – GO HAWKS! “Wilson has more playoff history to overcome than Newton” Actually NO. As you pointed out right before this comment.